Brake Pads, Transmissions, Drive Shafts, Springs, Clutches, & More! Lyons Truck Parts offers you new and used heavy duty truck parts at our facility in Kenosha, WI. Transmissions, differentials, truck brake parts, gear boxes, and all other heavy heavy duty semi truck parts- at affordable prices. At Lyons Truck Parts, we deliver the reliability you can count on! 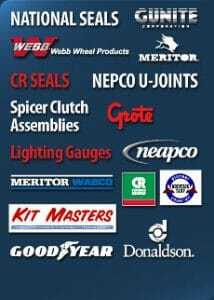 For over 50 years, we have been providing High-Quality Parts and Services to the trucking industry. We are continually expanding our line card to ensure we are exceeding our customers’ needs. Click here to download our complete Line Card or stop by our 50,000 sq ft facility in Kenosha today. If you have any questions regarding our products or services, please give us a call at 1-800-870-5060. © Copyright - Lyons Truck Parts - Website by One Click, Inc.